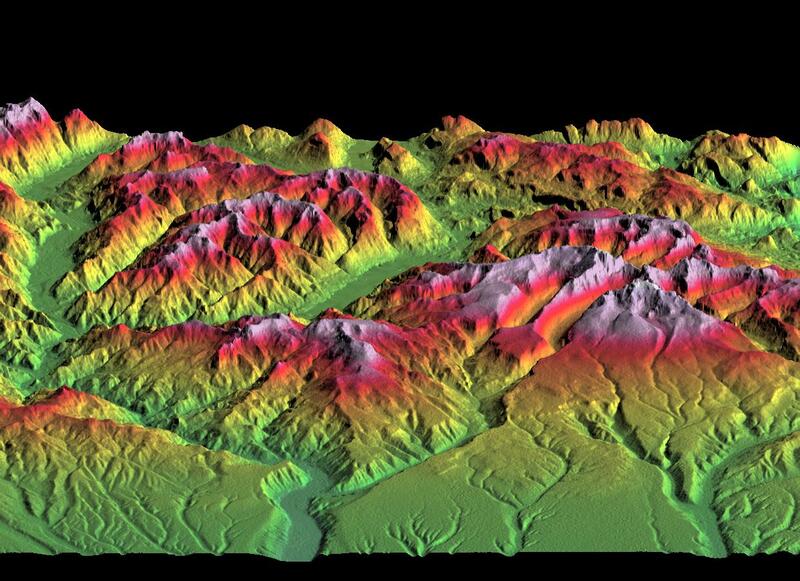 This depiction of an area south of San Martin de Los Andes, Argentina, is the first Shuttle Radar Topography Mission (SRTM) view of the Andes Mountains, the tallest mountain chain in the western hemisphere. This particular site does not include the higher Andes peaks, but it does include steep-sided valleys and other distinctive landforms carved by Pleistocene glaciers. Elevations here range from about 700 to 2,440 meters (2,300 to 8,000 feet). This region is very active tectonically and volcanically, and the landforms provide a record of the changes that have occurred over many thousands of years. Large lakes fill the broad mountain valleys, and the spectacular scenery here makes this area a popular resort destination for Argentinians. 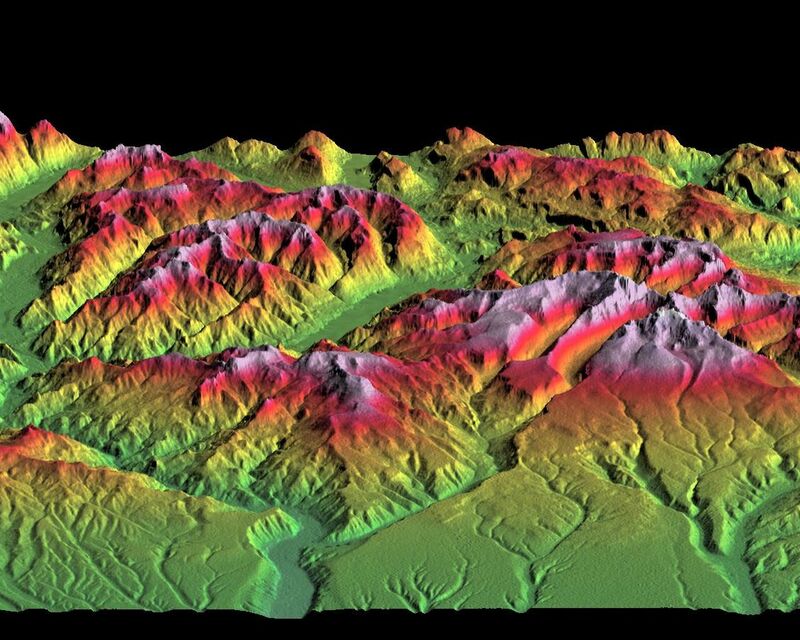 Three visualization methods were combined to produce this image: shading, color coding of topographic height and a perspective view. The shade image was derived by computing topographic slope in the north-south direction. Northern slopes appear bright and southern slopes appear dark, as would be the case at noon at this latitude in the southern hemisphere. 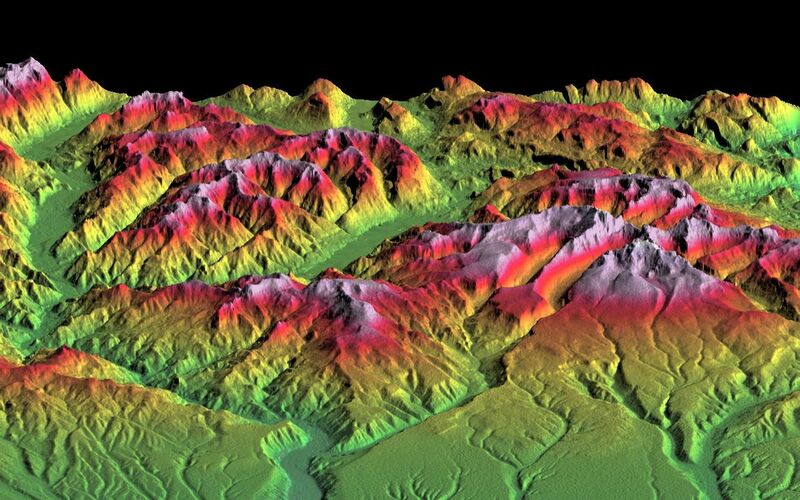 Color coding is directly related to topographic height, with green at the lower elevations, rising through yellow, red, and magenta, to white at the highest elevations. The perspective is toward the west, 20 degrees off horizontal with 2X vertical exaggeration. The back (west) edge of the data set forms a false skyline within the Andes Range. Elevation data used in this image was acquired by the Shuttle Radar Topography Mission aboard Space Shuttle Endeavour, launched on February 11, 2000. SRTM used the same radar instrument that comprised the Spaceborne Imaging Radar-C/X-Band Synthetic Aperture Radar (SIR-C/X-SAR) that flew twice on Space Shuttle Endeavour in 1994. 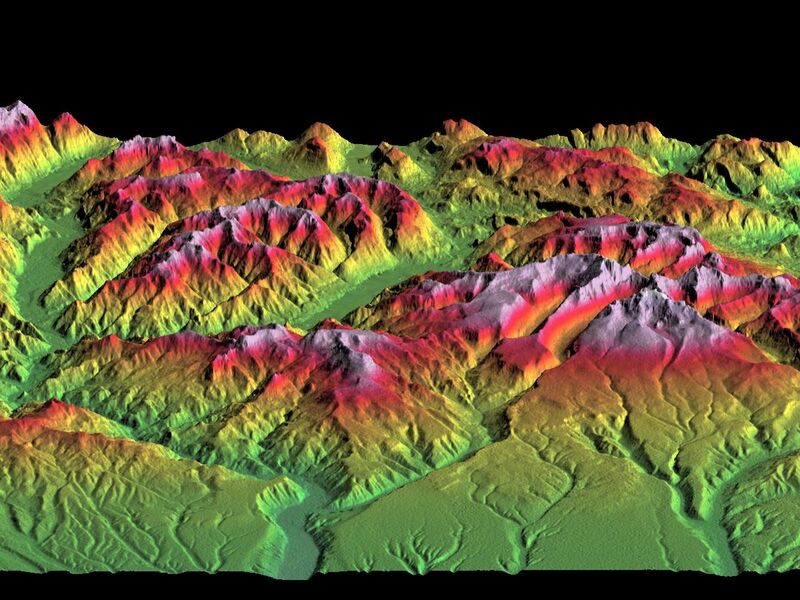 SRTM was designed to collect three-dimensional measurements of Earth's surface. To collect the 3-D data, engineers added a 60-meter-long (200-foot) mast, installed additional C-band and X-band antennas, and improved tracking and navigation devices. The mission is a cooperative project between the National Aeronautics and Space Administration (NASA), the National Imagery and Mapping Agency (NIMA) of the U.S. Department of Defense, and the German and Italian space agencies. It is managed by NASA's Jet Propulsion Laboratory, Pasadena, Calif., for NASA's Earth Science Enterprise, Washington, D.C. Location: 40.4 deg. South lat., 71.3 deg. West lon.